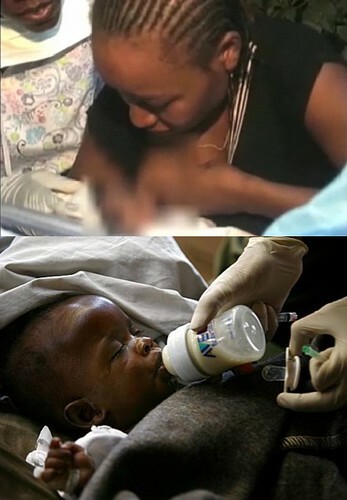 Description: Two media images of babies being fed in Haiti. The first is being breastfed. The entire breast is pixellated out. The second baby is being bottle-fed by a gloved hand. The bottle logo is very prominent. The bottle company, Avent, is one with long-standing global violations of the World Health Organisation Code (WHO Code) for the Marketing of Breastmilk Substitutes. ETA: No, wait, there’s one more thing I want to say. Many of these resources focus on babies and the immediate effect of (mostly) well-intentioned but misplaced infant formula “aid. There is much less focus on the effect on women. For many women, the only method of child spacing available to them is exclusive breastfeeding. With a lot of women’s breastmilk supplies disrupted by inappropriate milk replacements, where are you six months down the track? 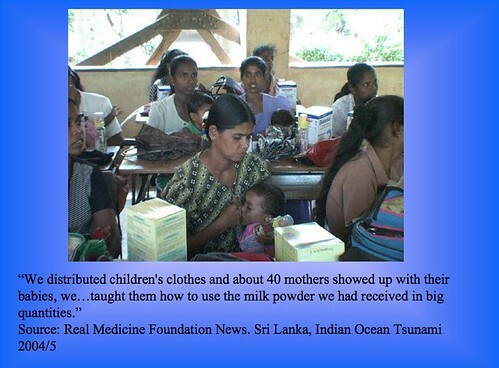 If the babies survive the artificial feeding in the first place – and, contrary to the ideas of some ignorant Westerners, diarrhea is not a mere nuisance in a disaster – you have a cohort of women who are not only scratching to spend a large proportion of household income on a continued supply of breastmilk substitutes, but are also pregnant again. Irresponsible “aid” doesn’t only affect babies, it contributes to poverty and illness for mothers. .-= Jill´s last blog ..Women Protest Violence Against Laboring Women in Bulgarian Hospitals =-. Hmm.. I wonder if the breast feeding mothers could drink the formula to allow for sufficient nutrients that they keep producing the milk for their breastfeeding babies? That’s what I would do if I were in a foodless situation now. Would that work? .-= Luschka´s last blog ..Helping Haiti =-. that’s an extremely practical idea, except that there’s still the issue with water supplies. Still, the mother’s immune system is far more mature than an infant’s, so perhaps the water purity would not be quite such an issue if mothers drank it. This evening in swedish television we could see a mother with her two days ols child complaining about that she “couldn’t even get milk for her baby” … Her breasts looked quite OK. Didn’t anyone tell her to breastfeed??? At LEAST because there is an emergency situation… My goodness! Mom’s milk for every baby please! .-= Frida Viibus Lundgren´s last blog ..BB-amning =-. I wonder if the breast feeding mothers could drink the formula to allow for sufficient nutrients that they keep producing the milk for their breastfeeding babies? Yes, but it’s far more efficient to send in food, rather than the incredibly expensive American (labelled in English) infant formula which is flooding in right now. Also, some formulas contain lactose, which all babies can digest fine but which many adults and older children have problems with. Culturally appropriate food makes more sense all round.